Actually I'm referring to the base claims of Jewish heritage amoung the Scots Irish allegdly go back much further. Claims go back to the time of the prophet Jeremiah. I'm just curious as to how accurate what I'd call anecdotal DNA can be traced. I'd also not discount trade back and forth between coastal Europe, the Mediterranean and North Africa. I'm possibly thinking also slaves in addition to merchants. The biggest problem is most of the ancient history of the Irish and Scots prior to the Roman records are nothing but ballads, folk tales and with the exception of ancient stone work and carvings are difficult if not impossible to separate fact from fairy tale. If a detailed excavation and DNA test of some of the ancient tombs and mounds could be successfully accomplished it would settle a lot of mumbo jumbo . But I know money , politics and traditions would prevent it. Just like I'd like to see a similarly done study on Cherokee DNA, but that's a whole other deal entirely. Of course the Romans did bring some slaves, but probably exported a lot more from the British isles. When they sacked Jerusalem and the rest of country and also later other jewish revolts, these actions yielded a lot of slaves and those could have gone anywhere. Most people accept that the various groups of celts that lived in british isles came from elsewhere. There were already people there that they mingled with. So many people want to be a lost tribe Israel for some reason. 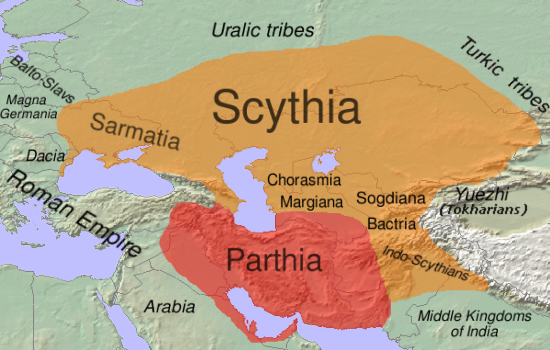 languages probably belonged to the Eastern branch of the Iranian languages. I would like to refer to your last point. Languages are not the overwhelmingly reliable source of ancestral tracking like some would like. Languages come and go, change and morph due to many reasons. Genetics dont. Genetics are better than languages, but in this case if the celts were Germans I would expect to see it reflected in the languages to some degree. The franks were/are a germanic tribe, as well. The French and german languages only similarity is that they are both spoken in europe. Yet franks and germans are literal cousins. Genetically identical. The difference is that the romans were succesful in thier conquest of frankia, and never were succesful in thier push northward into germania. By 586 bc, the 'lost ten tribes' were officially lost. They were conquered by a people of a different language and culture, who was conquered in turn by yet another, then cut loose to go wherever they would. It literally only takes exactly 2 generations for a language to be completely lost. Last edited by Ryan Taylor; 09-14-2018 at 03:01 PM. The frankish tribes did not originally speak French. It is believed that modern dutch dialects are derived from it. The franks were still speaking their language after the fall of rome. I am not sure how or when French replaced Frankish in what is now france. I do not know that history. Yes languages can be replaced quite quickly and can also persist for a 1,000 years before they disappear really depends a lot on circumstances. For example I can not speak the languages of my grandparents which in three cases were not english. A language can disappear literally overnight if a tribe gets exterminated along with all of the Y DNA. The mitochondrial DNA could persist a long time if the females are spared and inseminated by the conquerors. Normally when conquered a people will continue to speak their language for centuries which is what happened when the normans took over england. Eventually a new language or at first middle English and then modern english, but the influence of old english is still quite evident in our language. The germanic roots are there without doubt. Now the celtic languages in England proper except for a few holdouts did not fare that well and there are very few celtic words in modern english. we have them like whisky and bog. DNA is better evidence for sure and I am not aware of DNA showing that the celts were a germanic tribe. Whether you use DNA or language, neither 'lie', but DNA definitely shows lineage exactly and language only shows culture. Franks a Germanic speaking people who invaded the western Roman Empire in the 5th century. Dominating present-day northern France, Belgium, and western Germany, the Franks established the most powerful Christian kingdom of early medieval western Europe. The name France (Francia) is derived from their name. In a modern linguistic context, the language of the early Franks is variously called "Old Frankish" or "Old Franconian" and refers to the West Germanic dialects of the Franks prior to the advent of the Second Germanic consonant shift, which took place between 600 and 700 CE. After this consonant shift the Frankish dialect diverges, with the dialects which would become modern Dutch not undergoing the consonantal shift, while all others did so to varying degrees and thereby became part of the larger German dialectal domain. The Frankish language has not been directly attested, apart from a very small number of runic inscriptions found within contemporary Frankish territory such as the Bergakker inscription. The distinction between Old Dutch and Old Frankish is largely negligible, with Old Dutch (also called Old Low Franconian) being the term used to differentiate between the affected and non-affected variants following the aforementioned Second Germanic consonant shift. A significant amount of Old Frankish vocabulary has been reconstructed by examining early Germanic loanwords found in Old French as well as through comparative reconstruction through Dutch. The influence of Old Frankish on contemporary Gallo-Roman vocabulary and phonology, have long been questions of scholarly debate. Frankish influence is thought to include the designations of the four cardinal directions: nord "north", sud "south", est "east" and ouest "west" and at least an additional 1000 stem words. I did some quick googling because I really wondered what language the Franks spoke during the time of Charlemagne and earlier. By Charlemagne's time the French vernacular had already diverged significantly from Latin. This is evidenced by one of the regulations of the Council of Tours (813), which required that the parish priests preach either in the "rusticam Romanam linguam" (Romance) or "Theotiscam" (the Germanic vernacular) rather than in Latin. The goal of this rule was to make the sermons comprehensible to the common people, who must therefore have been either Romance speakers or Germanic speakers. Charlemagne himself probably spoke a Rhenish Franconian dialect of Old High German. Charlemagne's grandfather, Charles Martel (Hammer) stopped the muslim advance into France and saved western Europe. He probably also did not speak french.